It is easy to give a child something to eat, if you are with him/her all the time. However, children are not really interested in eating themselves. Therefore, if your baby attends some preschool courses, it is important to make sure he/she eats enough. The best thing you can do is make nice snacks that look and taste cool (not for you, but for the baby). They should also be healthy enough. Of course, the best things you can give your 3-6 years old child are fruits and vegetables. They contain all the necessary vitamins and minerals. However, it is also important for preschoolers to get some calories. The idea is to put some nuts, dried fruits, raisins, chocolate or neanut balls and dried cereals in a cup. You can wrap such snack-pack into a film, so that it would be easy to carry. Such cup is great, as it is easy to use and it contains a mix of useful snacks. It is ok, if your child, for example, eats only chocolate balls. He still gets his/her calories. Paper bags are easy to carry as well, and they look pretty cool. Popcorn is a first thing that comes in mind when thinking of such paper bags. It is actually useful, as corn contains many vitamins. Moreover, children do like popcorn, especially if it is flavored with something sweet. 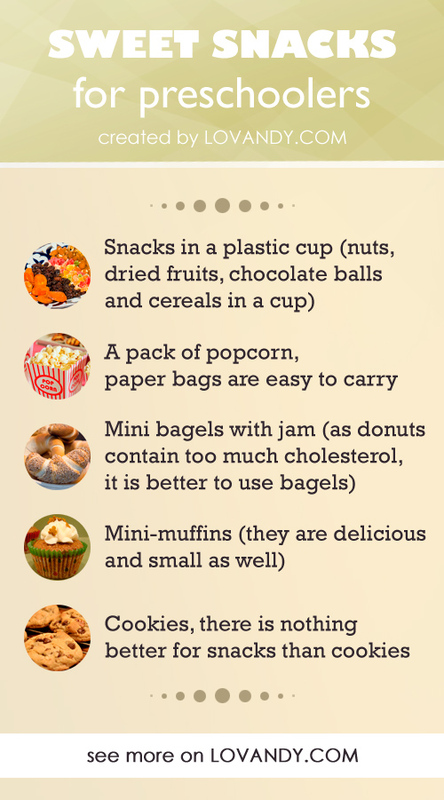 As donuts contain too much cholesterol, it is better to use bagels instead. Just cut them lengthwise and fill with some jam. It will not crumble as PB&J, but is still very tasty and useful. They are delicious and small as well. So, muffins are just nice for a snack meal. Cool thing about them, you can use a huge variety of flavors. Make muffins as your child likes them. There is nothing better for snacks than cookies. There is a huge variety of different recipes, for example, with raisins, cocoa, bananas, peanut butter. You can also just buy some. However, if you give your child some cookies, make sure he/she has something to drink. 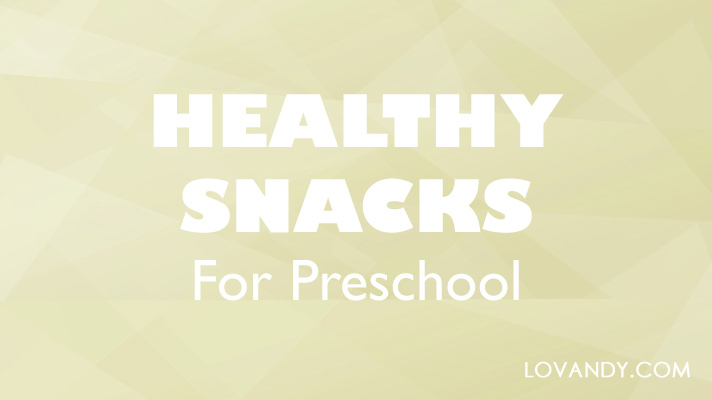 Snacks for preschoolers are meant to contain many vitamins and minerals. Nothing can beat fresh fruits and vegetables in this feature. That is why green snacks are best. Let us name the most beneficial fruits and berries you can give your baby. Berries are good for snacks, as they come in small pieces as is. You can use some mixes to make them interesting for your kid. It is needless to say how many vitamins there are in berries. It is no wonder why apple is a symbol of school and education. It contains many vitamins that energize your kid’s brain. They are also easy to eat. Being rich in carbohydrates, bananas are also good as snacks. They are easy to carry and tasty as well. Grapes are as convenient as berries. Moreover, their combination of natural sugars makes grapes sweet and beneficial for health. They are rather exotic, but tasty and beneficial too. That is why it is a nice idea to give your child some sliced mangos. Perhaps, he/she will eat them more likely, as nobody else on the playground has such fruits. You can basically blend some apples or any other fruit into puree and freeze it overnight using for example silicone ice pop molds. Such snack is just what you want in a hot summer. Just make sure your child eats it before it warms up too much. Vegetables are as important as fruits. They might be not that tasty snacks for your 3 years old children, who already know what they like and what they do not, but it is still necessary to eat some. Carrots are good as well. You can make some carrot fries, which are easy to eat and very beneficial. It is also convenient to carry. Moreover, you can mix it with carrots or any other vegetable to make tastier. Just put it into some plastic bag for your baby. He/she will be able to grab a slice any time, so it is really useful and convenient. They might become a reason of grievances, but the amount of vitamins in broccolis is indispensable. So, try to make some game in which one eaten broccoli equals a blueberry muffin. These are only the most convenient fruits and vegetables to carry as snacks. However, you can make some salads and mixes with anything else. The thing is to make sure it is easy to eat for your child, while being useful and tasty. Preschoolers need many vitamins and minerals for their health. 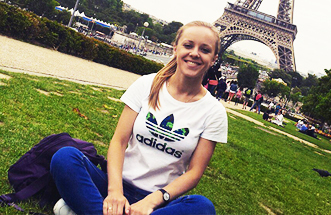 However, they also require a lot of calories, as children this age are extremely active. That is why it is a good idea for every mother to have a pack of snacks ready at any time, so that her child is always full.